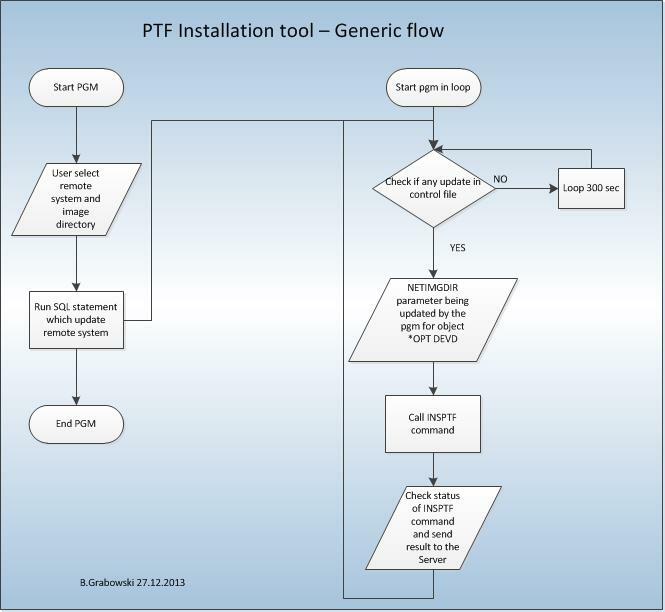 How to perform PTF installation from a single partition across multiple systems? Let me present a solution based on IBM i functions. This solution avoids copying iso images/image catalogs to multiple LPARS. Starting V6R1, IBM i introduce the ability to perform complete PTF installation via NFS (Network File System). I use this capability to perform PTF installation from a single system. A system – lets call it the Server, exports these images via NFS, and other IBM i clients use the repository for the PTF installations. IBM i 6.1 PTF’s SI39390, SI35186, and SI35189. The Server is the only system which hosts all PTF images, all installations will be performed from it. The Server system acts as NFS export server. Start NFS service with following parameter *RPC, *SVR, *MNT or just start STRNFSSVR SERVER(*ALL). On a remote system a job which run in loop, detects that installation is about to happen. Either it will create a new *DEVD with parameter TYPE ,MODEL *RSRCNAME, LCLINTNETA *SRVLAN an IP address pointing to the NFS Server (RMTINTNETA), and a path where an image catalog is located (NETIMGDIR) or it will update already created *DEVD by appropriate parameters. The loop job initiates the INSPTF command. The pgm monitors a result of INSPTF command, and send the result to the Server machine,and updates a DB. For instance GRPBRMS23 PTF has been successfully installed. Various methods can be used for transferring information across the systems. If a relation database directory entries entries is used, than QDDMSERVER must be authorized for some generic user. If this generic user has the same password across all systems, its better if it has very limited authorities. However, INSPTF must happen over a profile with *SECOFR authorities. Consider switching profiles within your program for a security reason. If all LPARS are hosted on the same physical server. The most efficient way is to use a virtual Ethernet adapter (resource type 268C). The network interface cannot be configured in the operating system (check pic1 pic2).